If Kelsy Olson's recent Torrid lingerie image thrilled fans by showing them her "temptress" side, her new campaign for Alfred Angelo will delight them just as much by presenting her in her more familiar angelic guise. And never has Miss Olson looked more heavenly than in this full-page bridal ad, which is running in the newest issues of Brides and Modern Bride. Indeed, this is the most beautiful bridal image that any plus-size model has created since Shannon Marie's wedding editorial in Mode. Alfred Angelo has a stellar history of selecting gorgeous and genuinely full-figured models, including Kati Kochanski, Tracie Stern, Nadia Pena, and most recently, Kailee O'Sullivan, but with Kelsey it has reached a new zenith of perfection. In photographing Miss Olson, the company verily looked into the heart of every man, found the eternal archetype of their dream-bride, and captured that image in print. Standing here atop the verdant grass, with the ocean stretching out behind her, and the clear blue sky soaring above, Miss Olson looks like a cherub plucked from the plains of heaven. Kelsey's image is so celestial that it seems almost inappropriate to note the sensuality in it--but that sensuality is very much there. The bustier of the dress is cut low to reveal the model's plump decolletage. The empire design accentuates the bust, and is easy around the waist and hips--the generous proportions of which one senses, hidden as they are. The expanse of the model's neck and shoulder area is exquisitely soft, with the clavicle wholly submerged in opulent fullness. Her arms are round and shapely, without a hint of muscle tone. She appears the very epitome of femininity, a gentle, yielding girl whom a suitor would worship for the rest of his life, cherishing and taking care of her, seeing that her every wish is granted, her every want satisfied. Never has Kelsey looked softer, more serene, more graceful, more purely feminine; a storybook princess brought to life. 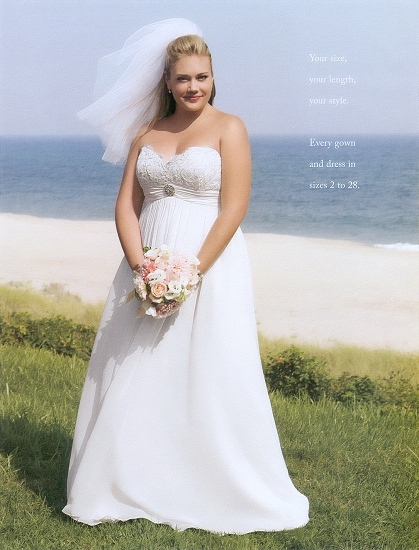 Like Kailee, Kelsey also appears in a full-page bridesmaid ad--this one from Modern Bride magazine. She renders the underweight girls with whom she is paired invisible, and would outshine any bride on her wedding day. Unlike the elegant wedding gown above, this bridesmaid dress is not particularly attractive, but the deep neckline does reveal the model's buxom contours, and the abbreviated length shows off Kelsey's legs--utterly gorgeous, thanks to the absence of muscle tone, and a naturally soft shape formed by luscious fullness. 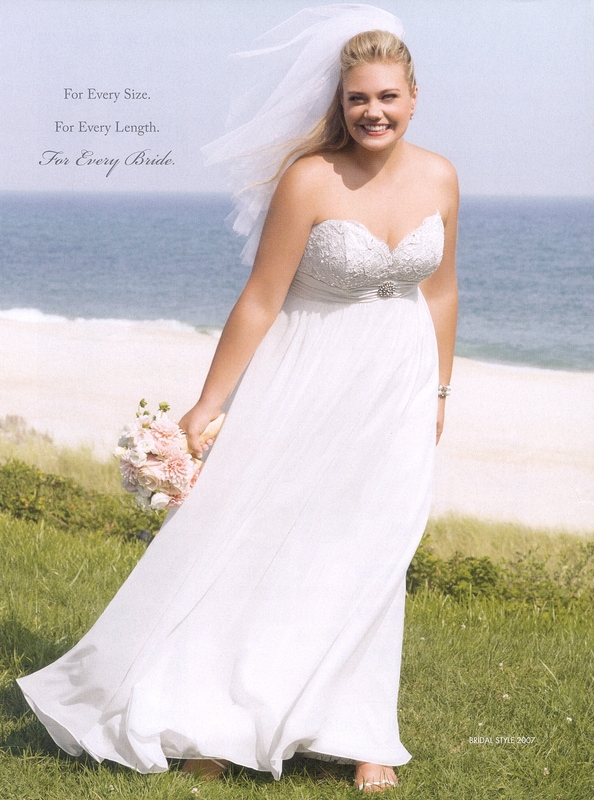 Another bridesmaid ad, running in both magazines, shows Kelsey in a more attractive style. The red colour reminds one of her Valentine's ad. Red always looks stunning on Miss Olson, as it contrasts the angelic quality of her blonde tresses and fair features with the innately sinful hue of the scarlet fabric. The design of the gown again exposes the glorious beauty of the model's neck and shoulder area, and note the intensely sensual detail of the soft curve of fullness escaping the dress just above the bust. Her expression is gentle and kind, in keeping with the appealingly docile qualities that she exudes in this campaign. The luscious foliage seen behind her enhances the idyllic nature of the images. Looking at these images is like stepping into an earthly paradise, a dream-world inhabited by the loveliest beings ever known. One final image from this campaign, although tiny, offers another lovely view of Kelsey in her scarlet gown. Note the blossoms flowering on the bushes behind her, as if nature itself were celebrating her beauty. Nothing could be as gorgeous as the sight of her fair tresses tumbling down her bare back, creating a longing in the viewer for tactile engagement. Her hair glows in the sunlight as if it were radiating its own celestial light. If there are angels in heaven, they cannot possibly be more attractive than Miss Olson. Alfred Angelo has surpassed itself in this campaign, creating perhaps the greatest bridal image that we have yet seen, and accompanying it with exquisite pictures of Kelsey in bridesmaid attire that allow the viewer to imagine himself in a dream-like world of ideal beauty. By her very nature, with her fair features, soft figure, and gentle looks, Kelsey is the epitome of a bridal model--indeed, of a bride. We hope to see more images from this exciting campaign in future Alfred Angelo ads. Last edited by HSG : 25th June 2009 at 06:53. I just love looking at these images, especially the first one. They're so tranquil, so peaceful. Yes, "heavenly" is the best word to describe them. It's easy to compare plus-size models to angels, but Kelsey fits the description. She actually looks like she could float amid the clouds. And how true- the softness of her figure is exactly what makes these pictures so appealing. It's astounding that celebrities torture themselves in gym-prisons to achieve ropy-muscled, mannish limbs, when Kelsey's soft figure is so much more beautiful. This is the campaign that Kelsey was born to create. One suspects that Alfred Angelo realizes full well what magic they have created with Miss Olson in this campaign. The Spring/Summer 2009 issue of Today's Bride magazine contains a second full-page ad featuring Kelsey, along with another bridesmaid image. Again, the model looks exquisitely soft and angelic, but whereas in the previous ad her demeanour was serene, here she is playful and whimsical--a child-bride, a girl as much as a woman. With the flowers in her hand, a divan of grass beneath her feet, and the seacoast behind her, this image is the essence of femininity--the blooms and the ocean being ancient emblems of womanhood. 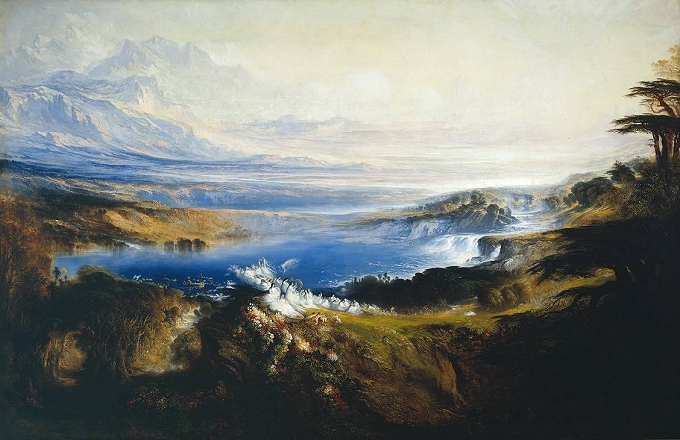 (One remember the Greek myth of Venus arising from the sea.) Her arms are round and full; no bones or angles are visible--all is perfect softness. No design could possibly be as flattering on a decolletage-rich model as this embroidered bustier--simultaneously elegant and alluring. But her expression is adorably juvenile and fun. She allows herself to be capricious in the way that a delicate princess can only be when she is safely under the protection of a powerful spouse; someone she can toy with, and be petulant with, knowing that his devotion is unshakable, and that she can do with him as she pleases. The bridesmaid image too shows Kelsey's kittenish side. Her enthusiasm is infectious--that big open-mouthed smile awakens joy in the viewer's heart. The fair tresses glowing in the sunlight give her a natural radiance. The emerald greed behind her contrasts vividly with her ruby-coloured dress. Miss Olson looks beautiful in anything she wears, but when she dons bridal/bridesmaid apparel, she becomes who she really is--or who she may have been, in a nobler age than our own: an Anglo-Saxon princess about whom legends were told, who inspired works of art, and compelled the sincerest devotion. Warriors fought for her love. Suitors died in her name. 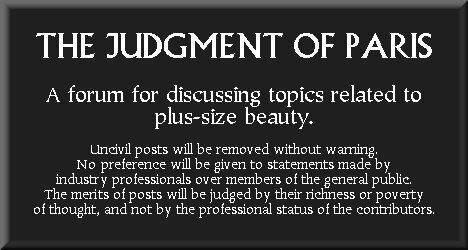 If more plus-size models with beauty such as Kelsey's were to make an appearance in popular culture, we would soon see a rebirth of art and myth. There really is no question that Kelsey Olson is the most beautiful model working in the industry today. This stunning campaign for Alfred Angelo is unlikely to be surpassed as the loveliest campaign of 2009. It confirms Kelsey's identity as a fairy-tale princess brought to life, and offers us a vision of sacred beauty more rapturous than anything the human imagination can conjure. 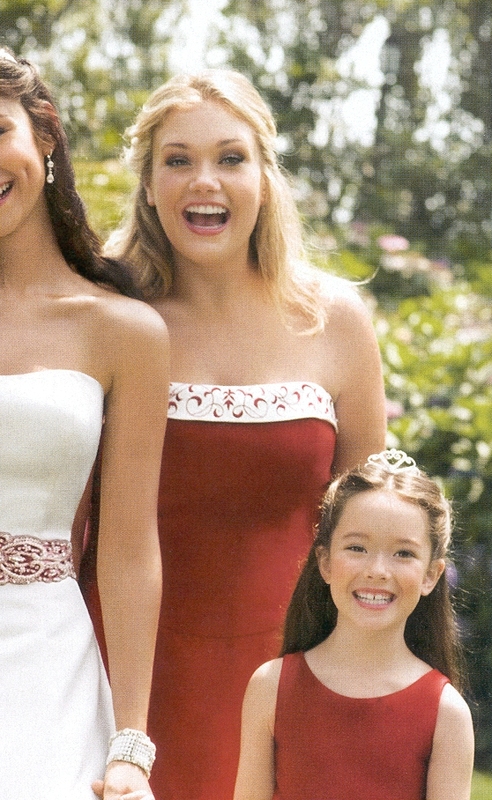 Besides obtaining the bridal magazines in which the above tear sheets appear, fans of Miss Olson will also wish to order the 2009 bridesmaid catalogue from Alfred Angelo, which includes a full-page version of the attractive picture of Kelsey in a scarlet gown that appeared earlier in this thread, at a smaller size. It is not possible to imagine a more gorgeous photograph than this. Kelsey's thick, luxuriant tresses, gilded by the sun, spill over her bare back. Her skin looks wondrously soft, as if it would yield to the touch. (Note particularly the alluring fullness of her neck.) The magnificent curve of her bust introduces a womanly element into a picture that is otherwise so angelic. The flowers behind her are in glorious bloom, as if all of nature were offering her a bouquet to match her full-blown beauty, paying tribute to her as the good Lord's most splendid creation. If there is a heaven, this picture is the closest that we will ever come to glimpsing it during our mortal lives, and Kelsey herself is the supreme incarnation of feminine beauty--soft, gentle, sumptuously well-fed, and very, very fair. Thank you for beautiful pictures! Scarlet dress was my favorite... so feminine, beautiful and, yes, angelic. Fans of Kelsey Olson (i.e., every single aficionado of plus-size beauty in the world) will not want to miss the July/August issue of Brides magazine. The issue contains another stunning new Alfred Angelo ad featuring everyone's most beloved young goddess. One can hardly conceive of a more breathtaking depiction of full-figured beauty. Kelsey's happiness verily radiates from her. This is the joie de vivre that girls possess when they eschew starvation and indulge themselves freely, avoiding gym-prisons and exercise-torture in favour of blissful relaxation and leisure. Kelsey's limbs look sensually soft and plump. Her buxom curves are elegantly yet seductively displayed by the opulent bustier. Her voluptuousness obviously captivated the photographer, for in this image, he photographed Miss Olson from the side, deliberately to exhibit the intoxicating fullness of her figure. No dress design could be more effective in showcasing the attractions of the curvaceous feminine form than this gown, its strapless and sleeveless design offering the viewer a heady view of the bare expanse of her neck, shoulders, and upper body. Like the frame of an Old Master painting of Venus, the gown is primarily a elegant border, for it is the soft skin of the model's disclosed figure that captivates the heart of any viewer who looks upon her. The model creates the persona of the archetypal bride (an archetype that resides deep in the human heart)--the pampered, spoiled princess addicted to ease and pleasure whom her suitor will worship in perpetuity. Note the pink lipstick, a girlish touch that plays up the model's youth. And as mentioned before, the idyllic setting establishes the perfect mood for the image, offering the promise of a dream-world of play, of sandy beaches, cool water, and soft grass--the very environment in which such beauty deserves to exist. This entire Alfred Angelo campaign, and this image in particular, captures the very essence of timeless beauty, with the setting and wardrobe harmonizing with the incomparable feminine grace and allure of Kelsey herself. This is probably my favourite campaign all year, rivalled only by Charlotte Coyle for Monif C and Kailee for MXM. Kelsey has never looked more gorgeous, and has never been photographed in a more timeless setting. The last image is particularly outstanding, and definitely creates the impression of an angel -- with the blue sky all around her, as if she were floating above the clouds, and the veil floating behind her subconsciously reminiscent of gossamer wings. Lovely to see her - but really, she should have been in the place of prominence. She completely outshines the bride - as any full-figured bridesmaid would. This campaign is absolutelz breathtaking. Kelsey truly is the perfect bridal model, because she is the very dream-image of a bride. It's a colossal graphic, but I simply have to share this page from the Alfred Angelo site. Not only is it a particularly lovely image of Kelsey, but it's a pleasure to see that she is placed in the centre. She completely outshines the other two models, who seem like her handmaidens, while she is the princess. Kelsey is the dream-image of a bride, the ideal that everyone holds deep in their heart of what a perfect bride should look like.